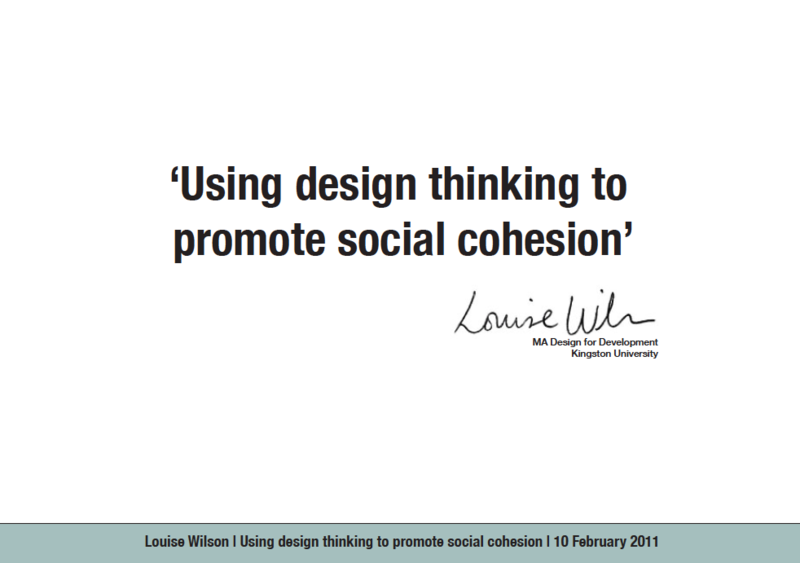 A couple of weeks ago I had the opportunity to present ‘promoting social cohesion’ to the current MA Design for Development students. 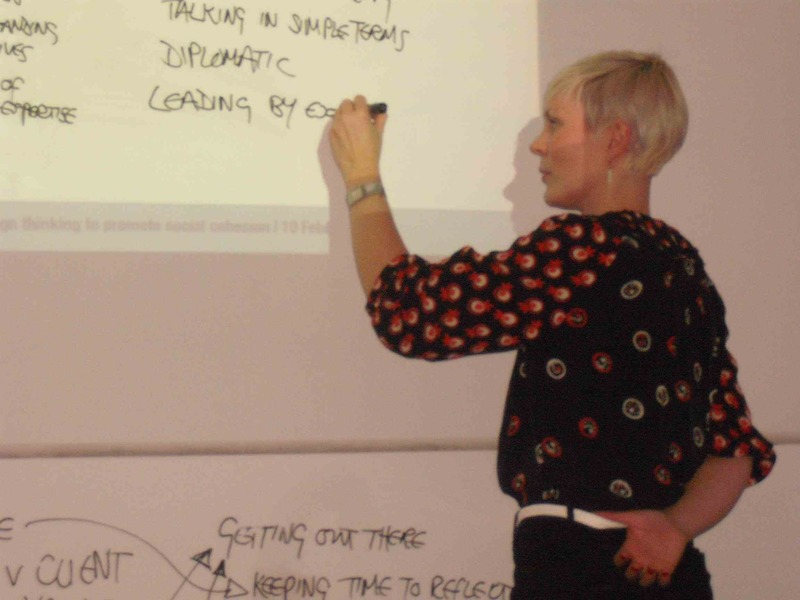 It is a subject that I am passionate about and always great to be able to discuss the topic with fresh participants. The current students are impressively up to speed with service design and social innovation and we had a great discussion. 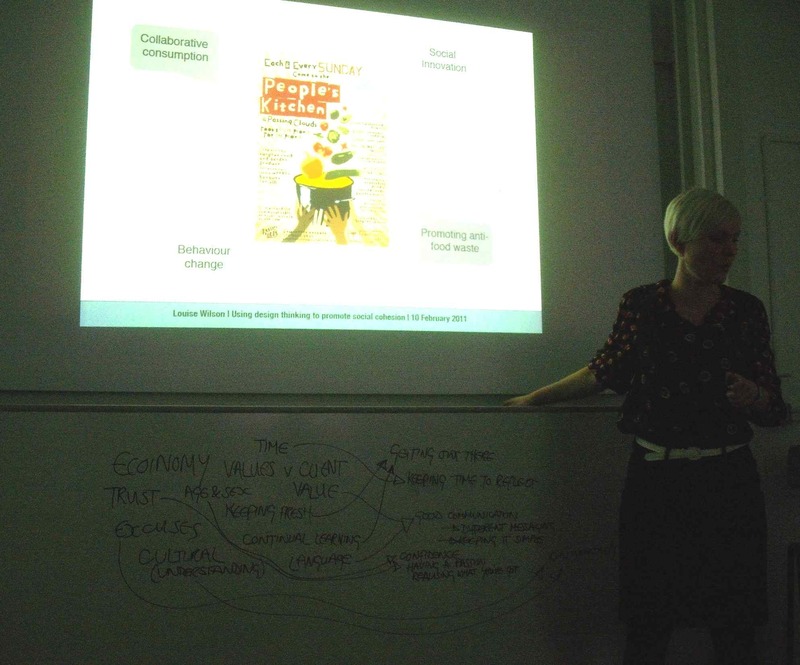 I have been working with a charity shop in Dalston to see how social innovation and service design methods can help improve the shop and it’s been a challenging yet rewarding project. The main topics covered in my presentation were the challenges faced with real life social innovation projects; understanding the end users and stakeholders, having empathy with the people affected by the project/service, thinking on your feet, having time to reflect and understanding how to use design thinking to tackle different situations. We then discussed the barriers and enablers for the four projects I am currently working on: Ecoinomy, a work placed engagement system that motivates employees to use less energy, the Water Design Challenge;, working with a school in Southampton to help them use design to reduce their water consumption, The People’s Kitchen;, a food waste collection initiative which provides a meal for the community and the charity shop project. It was a helpful way for me to reflect on the projects I am working on and very satisfying that we all came up with similar words/themes. • Continue to learn: a project never runs as originally planned. It is stimulating to be open to a change of direction (often for the better) and to use the insights gained along the way to benefit the project. • Keep a fresh mind: It is very easy to get too absorbed in a project, especially when you are the only service designer. Taking a step back or speaking to people outside about what you’re experiencing is essential. It is amazing how people unrelated to your project or service design can be helpful with an idea. • Be confident: There will often be times when a project isn’t going as planned or in the direction you had desired. Barriers come up all the time, stakeholders can change their minds about decisions and time can run out. It is important to stay confident at all times (or at least appear confident!) so that the rest of the team/stakeholders do not worry about the project. It is always possible to involve new people if necessary or discuss how to face a certain situation with the project team. • Add value: There is no point in carrying out a project (especially as a service designer/design thinker) if you are not adding value. Remind yourself that as the project evolves, you need to be able to measure how the project is going, think about where value can be added and refer back to your original aims on a regular basis.